I have a document that I open/edit often. I want to turn off the spellcheck functionality for this document, but not for all other documents (and I don't want to have to File/Options/Proofing every time I open it). Is there a way to turn off proofing selectively (i.e., on a per/document basis)? I found a better way to do this in Word 2010 after getting so frustrated with this. This is THE way to go if you ask me when working with multiple Styles, etc. You can modify the "Normal" style* for that document (which in turn modifies any styles based on Normal). From the Styles bar, r-click on Normal, select "Modify", click the "Format" button (bottom left), select "Language", and check the box labeled "Do not check spelling or grammar." * Not to be confused with the Normal template, changes to which would effect all subsequent documents. Not the answer you're looking for? Browse other questions tagged microsoft-word-2010 spell-check or ask your own question. How to open Word document on a shared drive, in read-only mode, every time? How quickly toggle smart quotes in Word 2010? 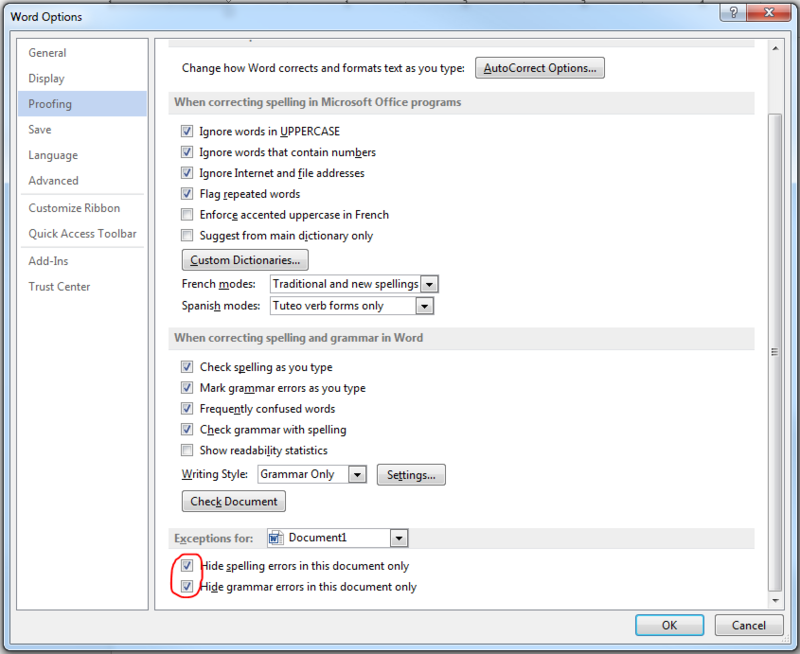 Can I use a character style to turn off spell checking for program code within a sentence in an MS Word document? Can MS Word detect single-sentence paragraphs?